South Korea’s second-largest flag carrier, Asiana Airlines Inc. is facing a serious allegation after a flight attendant was believed to have caused serious burn to a passenger last year. The passenger who goes by the family name Jang, is now suing the said airline with 200 million won ($171,000) in damages. The woman sued both the fligh attendant and the airline regarding the incident on March 17, 2014 while she was on board. The plane was bound to Paris from Incheon, South Korea. According to the released statement of Jang’s attorney, Jang asked the flight attendant for a cup of instant noodles while on flight. However, while the attendant was serving Jang, the noodles was accidentally split on her lower body. After medical examination, Jang was said to have suffered second and third degree burns on her thighs, abdomen and reproductive organs. The airline was said ta have failed to make appropriate medical actions to her burns and this caused her physical and emotional stress. Jand was a model and she said that she was planning to pursue a career in broadcasting and fashion with her physical assets but the incident made it impossible as she have burns which she called hideous. She also owns a bakery, but even that was affected by the accidents as she is now afraid to work near hot ovens. Instead of 200 million won, Asiana only offers 61 million won to cover the damages such as the medical expenses. 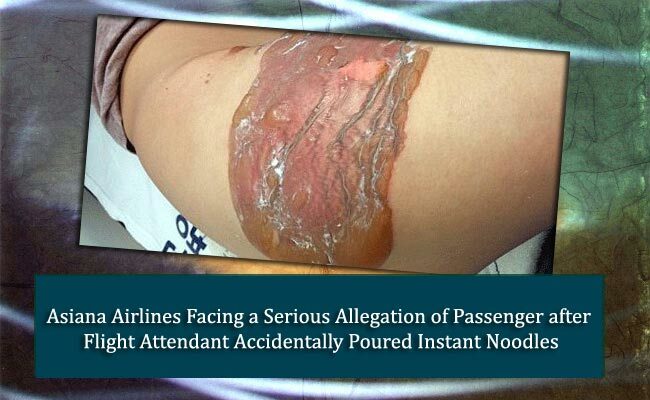 However, the airline argue that it was the passenger herself who knocked over the tray used to serve the noodles. It also stood its grounds that proper medical procedures were done under the supervision of a doctor on board the flight.